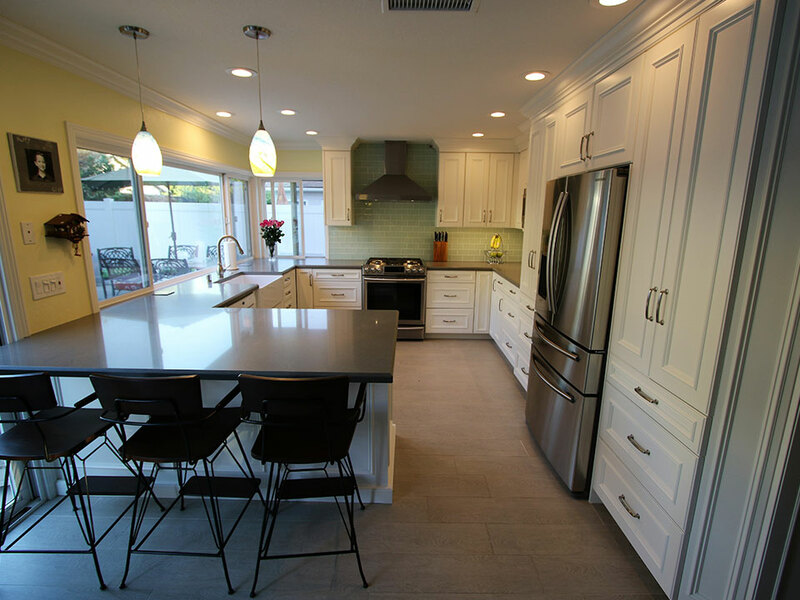 In the classy suburb of Tustin, the owners of a local home wanted to give it a bit of personality through a professional kitchen renovation. The original kitchen was fairly generic and unremarkable. This didn’t match at all with the owners’ affinity for brightness and cheer. We were asked to help update the kitchen with a few transitional design elements, as well as improve cabinet storage and incorporate some unique style accents. We started by laying the floors with Timber Frost tiles by Eleganza. That set the stage for the soft and muted spring-inspired palette we planned to implement in our subsequent work. 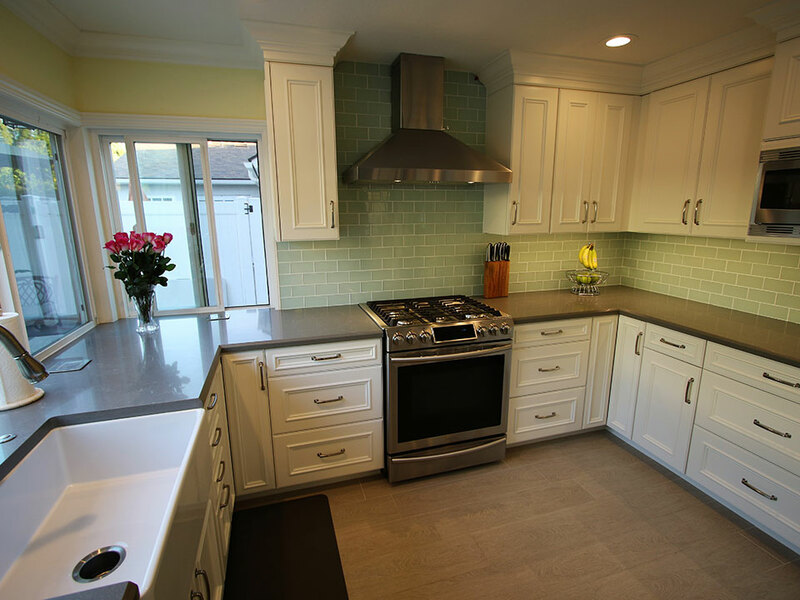 The maple custom cabinets were built in a G-shaped layout, with a Euro-style construction, Victorian (outer bead) style doors, and a powdery white DE Swiss Coffee finish. They include fold-out corner doors, built-in lazy susans, and a vertical tray pull-out. The doors and drawers were affixed with Belcastel stainless steel handles, and the undersides of the cabinets feature hidden rail lighting. 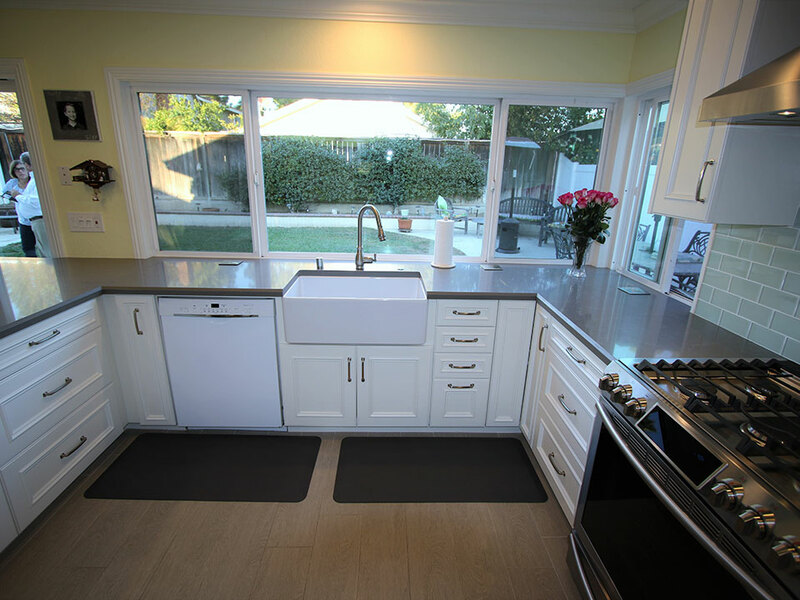 Surfaces were covered with sleek gray countertops that have a 1 ½” Single Bevel (Short) edge. 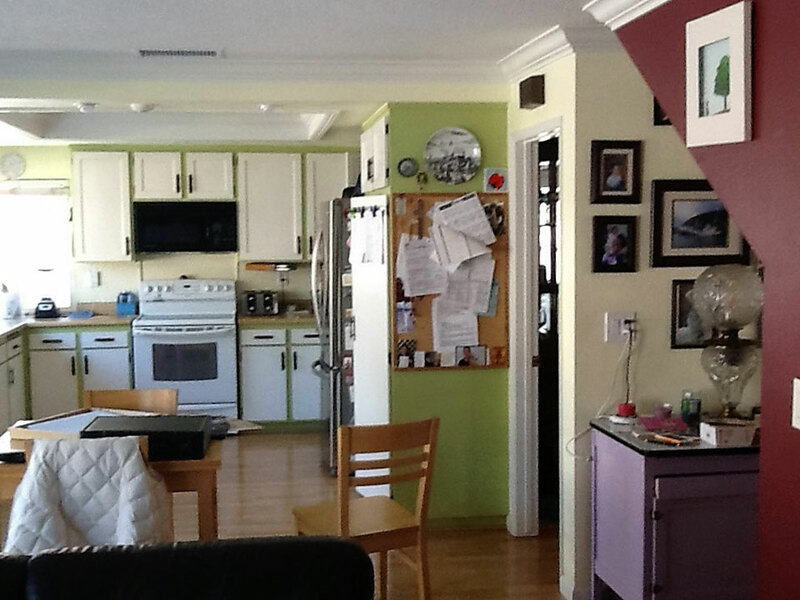 This protrudes over the outer section of cabinetry to create a casual breakfast bar. Here, hidden storage consists of a cabinet concealing pull-out tray shelving. At the tops of the cabinets, you can see where we put in Colonial crown moulding, which was also extended to the window casings and the rest of the walls. 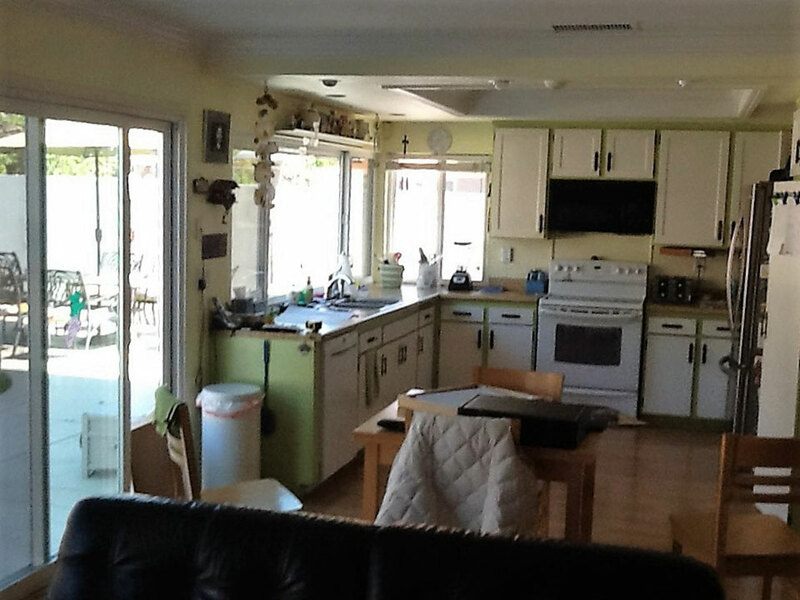 The walls themselves were painted pastel yellow on the outer side of the kitchen, adding a sunny, effervescent feel. 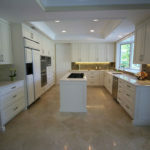 As for the rest of the kitchen’s walls, they were covered with a backsplash of glossy tiles in a subtle mint hue. This colorful interplay of wall colors is enhanced by the addition of hanging lamps with vibrant casings. A fresh and charming appearance is the final result. 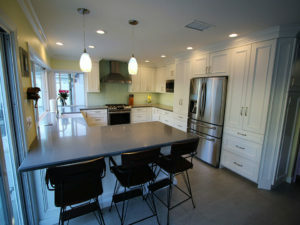 Our client chose mostly stainless steel appliances for their new kitchen. These include a Samsung 30” 5.8 cu. ft. Slide-in Gas Range with Intuitive Controls beneath a 30” Stainless Steel Range Hood, set against the center of the kitchen’s back wall. To the right, the GE Profile™ Series 1.1 Cu. Ft. Countertop Microwave Oven was built into the cabinetry, as was the LG 36” 23 cu. ft. Counter Depth 4-Door Refrigerator with FlexZone™ Drawer. 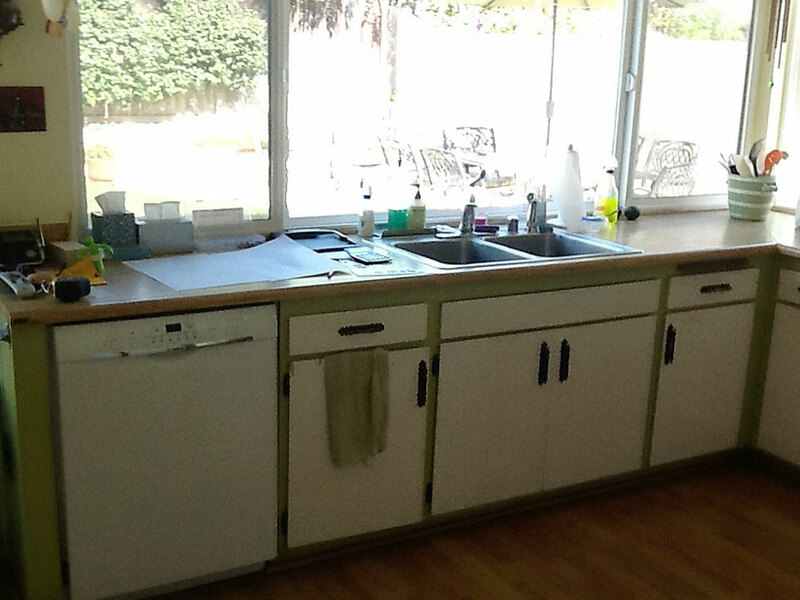 Beneath the kitchen window is a large undermount apron-front sink. This is neighbored by a Bosch 24″ Recessed Handle Dishwasher, selected in a white finish so that it could blend in with the surrounding cabinets. 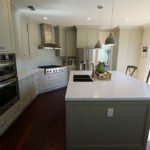 Looking for a free quote for your own professional home renovation? APlus is ready to help! 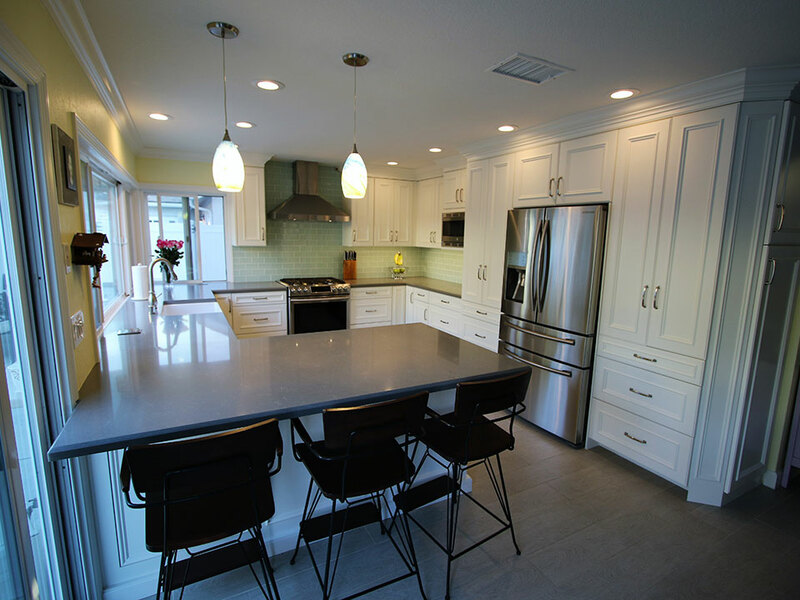 Our contractors can easily determine a ballpark budget for your personal kitchen, bathroom, or full-home remodel. 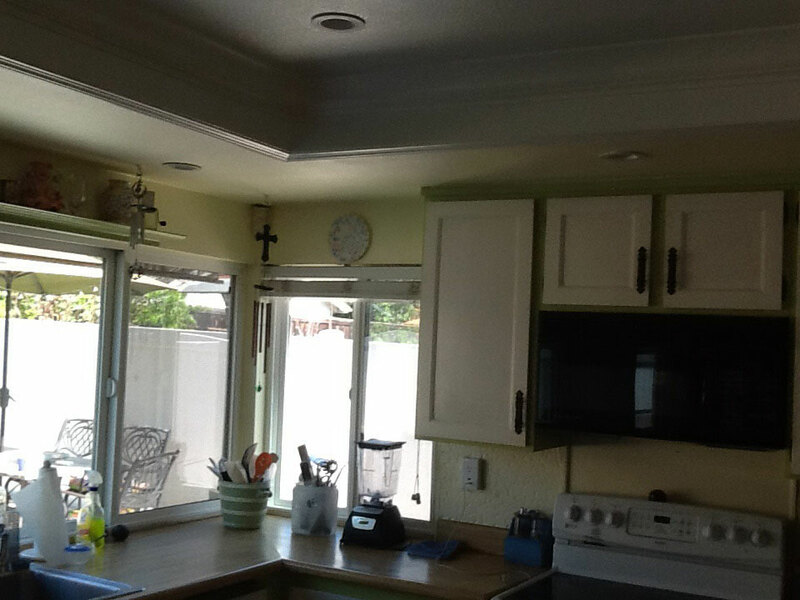 We service homes throughout all of Orange County.